Why is change so hard? It’s the one constant in life – we all know that change is inevitable. We grow older with each passing second, we observe the changing seasons … and then there is technology: the moment you buy your new gadget there’s already a bigger and faster one in the pipeline. Yet we resist (often necessary) change. The brain treats many social threats and rewards with the same intensity as physical threats and rewards (Lieberman, & Eisenberger, 2009). The capacity to make decisions, solve problems and collaborate with others is generally reduced by a threat response and increased under a reward response (Elliot, 2008). The threat response is more intense and more common and often needs to be carefully minimized in social interactions (Baumeister et al, 2001). Studies have shown that the five SCARF domains activate the same reward circuitry that physical rewards activate, like money, and the same threat circuitry that physical threats, like pain, activate (Rock, 2009b). This has a very real impact in our lives, especially our work lives. With a world in turmoil and many organisations focusing strongly on cost reduction, change has become an everyday occurrence. It is seldom that one or more of the SCARF elements are not threatened by organisational change. Think of a restructuring for example, and the potential impact is has on someone’s sense of Status, Certainty and Relatedness. Also, what criteria are used to base decisions on … is it Fair? When communicating change, it’s important to keep these 5 domains in mind, and as far as possible avoid activating a threat response. For example, let’s take the element of Certainty. 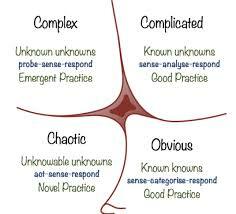 Most changes involve a certain level of uncertainty, the complex world we live in is anything but predictable. However, the threat response can be minimised by providing as much pertinent information as possible. For example, imagine waiting at the airport to board your flight home after a long day of meetings. Just when you’re getting ready to board, you hear that your flight has been delayed … indefinitely, with no clear reason. How do you feel? Now imagine receiving the same news, however you get additional information … the flight has been delayed, you are given a plausible reason, and you’re told it will an hour to resolve and that you’d be kept up to date with progress. You’d probably still be upset, but because you have more information, your sense of certainty is not as challenged. Change is inevitable and sometimes unpleasant, but by thinking strategically about how we communicate about the change, and how we manage it, we can certainly make it easier on people. Next Next post: Who creates our reality?